Ever go out in the wind and end up with a mass of tangles where your hair used to be? Have a rough night and wake up with a bird's nest on top of your head? Getting rid of the tangles at that point can be miserable and can damage your hair, but by following a few steps you can minimize the split ends and the headaches. Some people will tell you that your hair is the most vulnerable when it's wet. Actually, wet hair stretches more than dry hair does, which means that with gentle detangling, you can go easier on your hair by working on it while it's wet, which is why the following steps are for detangling in the shower. 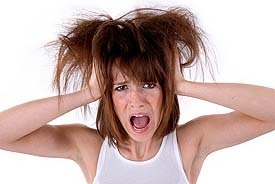 Shampoo your hair as you normally would, but be careful not to pull on knots while you work the shampoo in. Condition your hair, and before washing it out, comb it through your hair with a wide-tooth comb. start and the ends and gently work up to the top. If some spots are more difficult than others, apply more conditioner and let it sit for a minute. This will allow your hair to slip out of the tangles more easily. Rinse the conditioner out of your hair, gently combing the hair with your fingers as you do. Pat your hair and wrap it in a towel, but don't rub it too much - that can cause new tangles and won't be helpful. If you must blow-dry your hair, do so on a low setting while preventing the hair from tangling while brushing from the bottom. In the end, you should end up with smooth, tangle-free hair. Megan is the Web editor for Overstock Drugstore, an online pharmacy that offers great deals and great service on health and beauty products you use every day, including Biolage Normalizing Detangling Solution. Overstock Drugstore believes in offering the best products and the best service, including a help line that goes to a person every time. To learn more, visit OverstockDrugstore.com.